3RT Contactors are of a compact size enabling electrical cabinets to be configured with high packing density, furthermore the auxiliary switch blocks and solenoid protective circuitry are located within the contours of the contactor. This makes it easier to expand the system and saves considerable space in the electrical cabinet. 3RT Contactors up to 250kW offer optimum contact reliability and an extremely high level of ruggedness. Furthermore, compact electrical cabinets can be configured with high packing densities. 3RT Contactors are available with AC or DC control coils making the 3RT Contactor ideal for any control system. The AC coils are available in either 24V 50/60Hz, 110V 50/60Hz or 230V 50/60Hz with the DC being available in 24V DC. 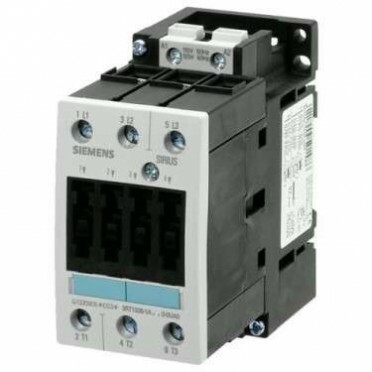 3RT Contactors have three main contact elements, in order to achieve maximum flexibility, Auxiliary Switches (3RH19), Surge Suppressors (3RT19), Mechanical Interlocks(3RA) and Installation Kits (3RA19) are all available separately.